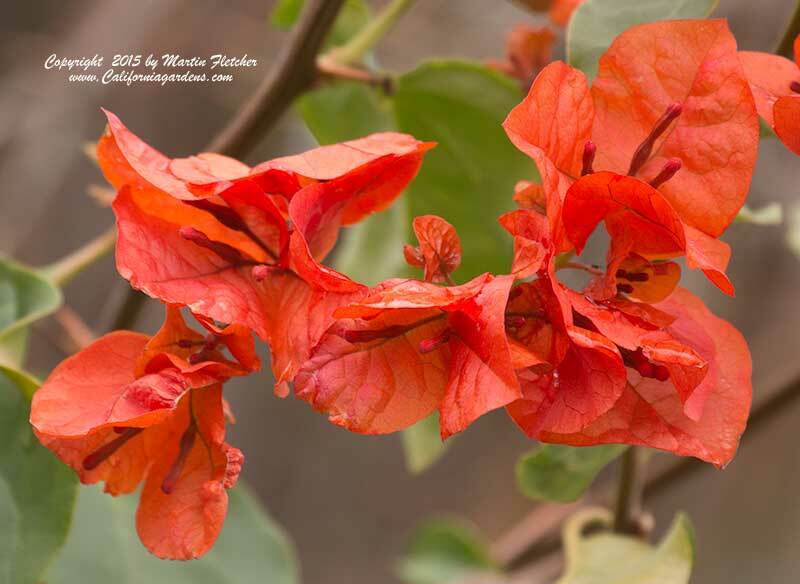 Bougainvillea Flame is a rich orange flowered vine. Actually the flowers are small and white and it is the bracts that are orange. Bougainvillea Flame is slow growing. Once it gets to the size you want it that is a good thing. The roots of Bougainvillea are tender and easily damaged when planting or if you try to put annuals around the base of the plant. I am careful when removing Bougainvillea from the pot, especially if it is rootbound. Bougainvillea Flame is fairly drought tolerant once established. The smaller branches will freeze in a light frost. For inland plantings it is best to protect the lower part of the plant for several seasons to keep at least a part of the plant alive. I often wrap them with cardboard for the winter. After the stems thicken they are fairly cold hardy but the top might be burnt away each winter. I am careful to allow a few stems to grow long since the flowers are at the end of the branches and if they are all trimmed there won't be any flowers. And what is the point of a Bougainvillea if it is just green. Bougainvillea Flame is a colorful addition to the Butterfly Garden that will attract the Cloudless Sulfur Butterfly for nectar. Flowers and foliage of Bougainvillea Flame. High resolution photos are part of our garden image collection.